An octopus with a porcelain plate stuck to its suckers has led to the discovery of a hoard of ancient pottery, South Korean scientists say. A fisherman caught the octopus off South Korea's west coast in May. He said the animal appeared to be hiding under a plate. Archaeologists searched the area and discovered a 12th Century wooden wreck buried in mudflats. They said more than 500 pieces of porcelain had been recovered so far. "These are the highest quality artefacts ever discovered in our seas," said Yun Yong-i, a Korean art history professor from Myongji University. Moon Whan-suk, from the National Maritime Museum, expressed surprise that the tiny octopus - about the size of an orange - had managed to hold on to the plate. He told Reuters news agency: "I can't believe how such a small octopus managed to cover its shell with such a large plate. "I guess it meant for us to discover the artefacts." The porcelain, found near Taean, south-west of the capital Seoul, is thought to date from the Goryeo dynasty, which ruled Korea from the 10th to the 14th Century. Experts say the 7.7m-long (25ft) wreck could contain up to 2,000 further pieces, including ancient bowls, plates and other types of pottery. 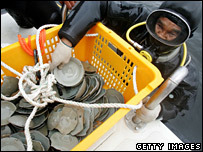 Several shipwrecks laden with relics have already been found along the west coast of South Korea.